Aspen, nestled in the heart of the Colorado Rockies, is a former 19th century mining town that has been transformed into a world-class ski resort. The area's natural beauty attracts visitors throughout the year, but the winter ski season is especially popular - particularly with celebrities. The small town has a permanent population of around 15,000. That number swells to around 25,000 in the height of the ski season. Many Hollywood and recording stars have homes in and around Aspen, including John Denver, Michael Douglas, Mariah Carey, Jack Nicholson, and Goldie Hawn. Aspen was founded in 1879 as a mining town. Originally named Ute City, it was renamed Aspen, after the trees of the region in 1880. In the late 19th century, Aspen was the nation's leading producer of mined silver. The town quickly expanded and by 1900, the facilities included an opera house, two theaters, and electric lights. However, demand for silver declined in the early 20th century and by 1930, Aspen was little more than a ghost town and had just 700 residents. In 1946, the Aspen Skiing Corporation was founded to promote the area as a winter resort destination. The area was immediately popular with Hollywood celebrities and other notables. The plan was to make Aspen a center for the arts and cultural as well as sports and to that end, they began the Aspen Music Festival and School, which still thrive today. The 673-acre Aspen Mountain is popular with ski enthusiasts from all over the world. The area offers 76 trails for skiers of all skill levels. In addition, Aspen offers snowboarding, cross-country skiing, sleigh rides, and ice skating. The town of Aspen offers excellent shopping, dining, art galleries, and cultural events. Aspen is accessible by air via commuter flights from Denver and by car. Unlike Vail and Cooper Mountain which are just off the highway, Aspen is accessible only via twisting mountain roads that are frequently closed in the winter. Accommodations in Aspen range from large resort hotels, like the Ritz Carlton and Little Nell to historic inns, such as the restored Jerome Hotel. Aspen is also home to a number of bed and breakfast inns and one to four-bedroom condos, some of which sit right at the base of the slopes. Snowmass - Located just west of Aspen, Snowmass is the largest of the Aspen Skiing Company resorts. The area boasts 88 runs and elevations of up to 12,500 feet. Snowmass gets up to 300" of snow each season. 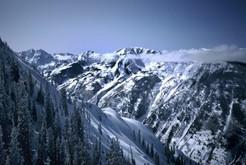 Aspen Highlands - Adjacent to Aspen and Snowmass, Aspen Highland is noted for its advanced and expert skiing terrain. Its "Highland Bowl" is one of the most challenging runs in the world. Of the area's 131 runs, 36 percent are expert and 16 percent are advanced. Buttermilk - The easiest of the Aspen Mountain ski areas, Buttermilk offers 44 ski runs, 35 percent of which are for beginners and 39 percent are for intermediate skiers.